The Queensland Government issued a new Draft South East Queensland Regional Plan yesterday to plan for the housing and infrastructure of the region where it identifies massive population growth resulting in an extra two million people making it home to 5.35 million people in 2041. Not surprisingly the Gold Coast features the largest percentage growth in SEQ where it is predicted the population rises to an estimated 928,000 people after 372,400 new residents move into the area. 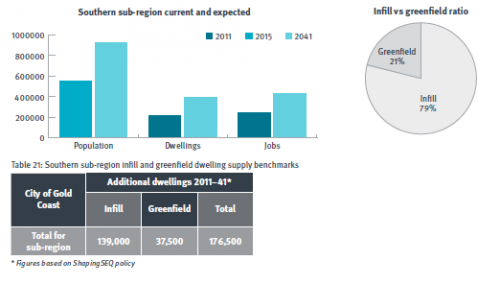 Housing that many additional people in the region is always going to be a challenge and the regional plan prefers a greater role for the redevelopment of existing land with infill developments rather than new greenfield developments. Most of the infill development will consist of higher density living whereas the greenfield developments of Coomera, Pimpama and Upper Coomera is going to focus on stand along housing on residential blocks. The new Regional Plan intends to ensure the urban sprawl will not choke out the green belts between Brisbane and the Gold and Sunshine coasts by ecological “inter-urban” breaks. 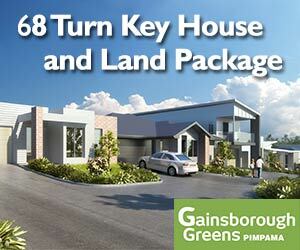 One of these will be located just north of the current greenfield development area of Coomera. The report does not identify any new land development outside the current footprint and the Greenfield development is specifically targetted to the Coomera District. 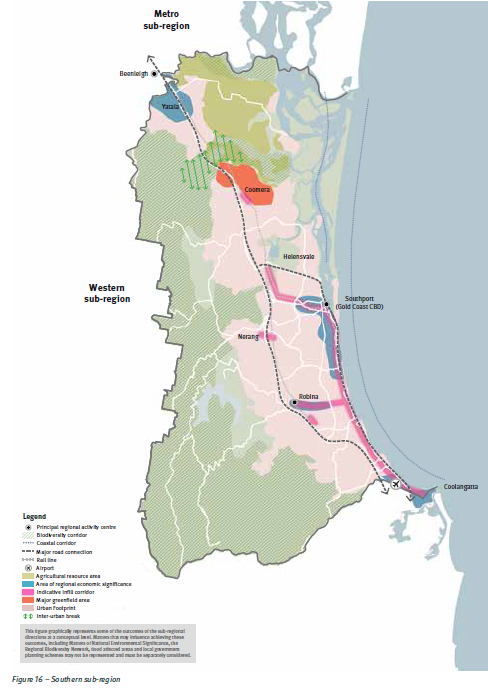 Of these areas, Coomera will accommodate the largest proportion of the sub-region’s planned greenfield growth. Assuming any local constraints can be resolved adequately, residential density and housing diversity will increase in proportion to a location’s proximity to employment opportunities, services or public transport frequency. These places will develop as high quality new communities. a corridor for a second road running out from Beenleigh alongside the M1 and running through Coomera and down to Southport.